I’m one of those people who firmly believes bacon has a place in every meal. Yes, this includes dessert. My absolute favorite way to accomplish this is my maple bacon cupcakes. If you’ve ever been to a party at my house, or even a party where I was in attendance, chances are you’ve tried one of these babies. They are literally my pride and joy. This recipe is completely gluten-free and dairy-free, but if you can eat both of those things, feel free to use them in the recipe. Also, the best part about these is because there’s bacon in the batter, and as a garnish. The more bacon, the merrier. Preheat oven to 375°F and line your mini cupcake or regular-sized muffin tin with cupcake liners. Line a baking sheet with aluminum foil. Place a cooling rack on top of the baking sheet. Place 4 strips of bacon on cooling rack, put pan in the oven, and cook for 15 minutes. Dice the remaining 4 strips of bacon. Placed diced bacon in a medium-sized pan over medium heat. Cook for about 5 minutes, or until bacon is cooked thoroughly. 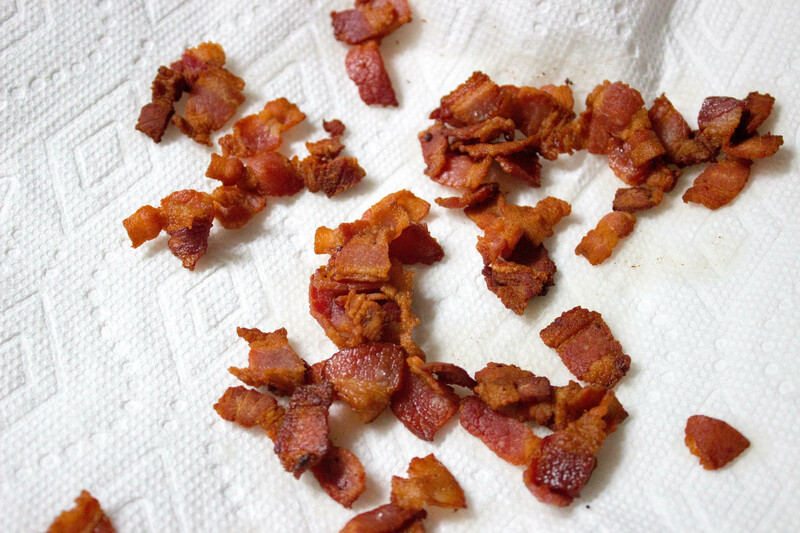 Remove cooked bacon to a plate lined with paper towels to absorb the grease. In a small bowl, combine 3 tablespoons maple syrup and 2 tablespoons brown sugar. Once bacon in the oven has cooked for about 15 minutes, brush each slice with the maple syrup and brown sugar mixture. Place back in the oven for 5-10 minutes, or until bacon is cooked through. 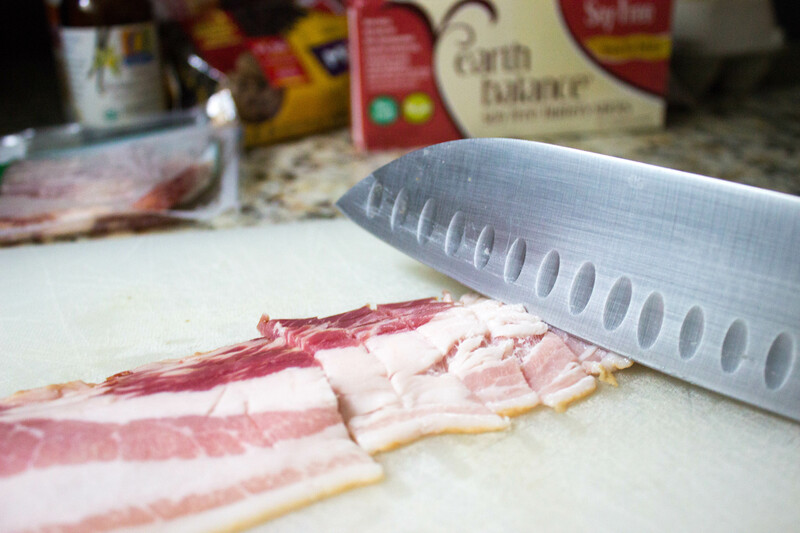 When bacon is done, remove to a plate and change the temperature of the oven to 350 degrees Fahrenheit. In a separate, medium bowl (or bowl of a standing mixer if you have one), add 1 stick softened butter and 3/4 cup sugar. Beat the butter and sugar for about three minutes, or until fluffy. Add the eggs one at a time, and vanilla, and mix until combined. Turn the speed of your mixer down to low, and add half of the dry ingredients. Add the coconut milk creamer (or cream). Mix until combined, and then add remaining dry ingredients. Add diced bacon from the frying pan to the batter mixture and mix to incorporate. Fill each cupcake tin 3/4 of the way with batter. Bake the cupcakes until golden brown, or until you insert a toothpick and it comes out clean. If you’re making mini cupcakes, this will be about 10 minutes, or 20 minutes if full-size cupcakes. Remove cupcakes to a cooling rack. In the bowl of your standing mixer, add 2 sticks softened Earth Balance. Mix on high for about 2 minutes, or until butter is whipped. Turn mixer to low and add powdered sugar. Once sugar is fully incorporated, add maple syrup, vanilla, and coconut milk creamer, and mix thoroughly. Place frosting in a piping bag (or Ziploc with one of the corners cut), and ice your cooled cupcakes. 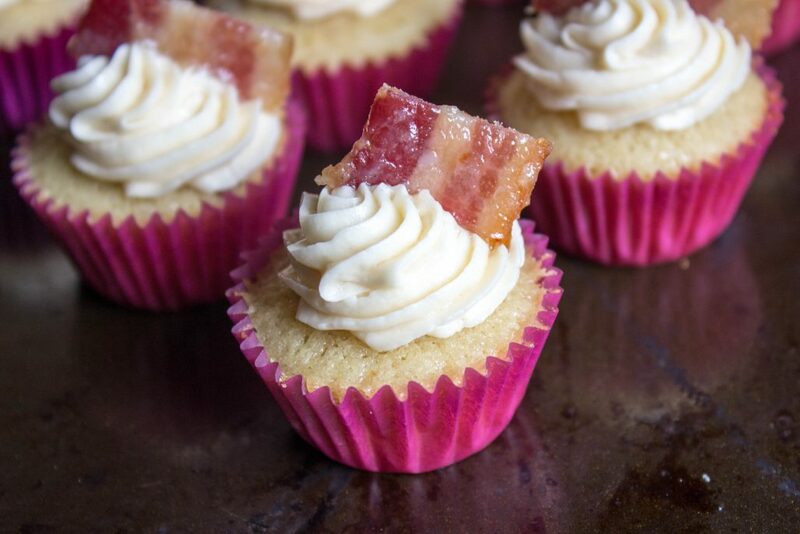 Slice candied bacon into pieces and garnish each cupcake with a piece.